Prior to the Deacon's Choosing Dinner there is a meeting where the Deacon receives the chain of office and is sworn in. 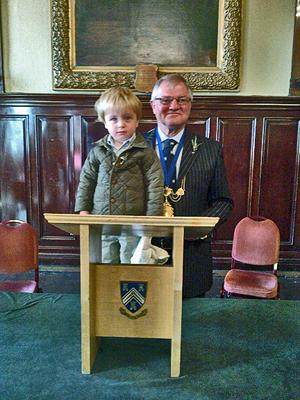 At the Deacon's Choosing Meeting on 21st September 2012, Past Deacon J Alan McLennan brought his grandson Archie William Elliott who was the youngest member of the Incorporation of Masons present . Archie was born on 15th June 2010. Archie was eager to congratulate Deacon Brian Evans on reaching the highest rank within his Trade. Interestingly our oldest Past Deacon James Hamilton Smith was also in attendance and it may well be that the Masons had the greatest span of ages at this meeting. Archie William Elliot, the youngest member of the Incorporation at the Deacon's Choosing Meeting of Deacon Brian Evans in 2012. 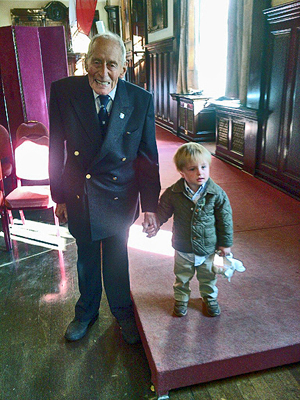 James Hamilton Smith, the oldest Past Deacon and Archie William Elliot the youngest at the Deacon's Choosing Meeting in 2012.